Hello Charlie! (sniff..sniff Goodbye Dave!) Episode #100 was outstanding, as I knew it would be. But I wanted to start this email by talking a little bit about J. David Weter. It was sad to hear that he would no longer be a part of the show. I have loved all of his segments and I truly..truly love it when you two get together on a podcast. There’s some sort of chemistry or camaraderie that makes me smile and want to listen even more intently. I was happy to hear that he will be a part of your final broadcast. It was your show that introduced me to him and where I found out about his other podcasts, which I also enjoy. PADSmash! An Incredible Hulk podcast is my favorite, but I have enjoyed Superman Forever Radio and the short-lived Smallville Chronicles. I love Dave’s Daredevil Podcast and will miss Starman Observatory. I hope you can pass along my well wishes and let him know he will truly be missed, if that even makes sense since I can still listen to him every Sunday. Now let’s talk a little bit about me and podcasting. For the past several months I have been contemplating doing a podcast of my own. I was thinking of a Superboy (Superman when he was a boy) podcast (with Dave’s permission), but now you guys have me thinking about doing a DC Comics Presents one. (also hopefully with Dave’s permission) It would have a definite ending point and I could reach the historic landmark of 100 episodes like you too. I think I have my wife’s blessing on it, so that is a major roadblock out of the way. And I already have the first 32 DC Comics Presents issues, so I could do that many until I find #33. I guess the truly hard part to podcasting would be the preparation. (Reading the comic, Synopsis, etc.) I may need to call upon you for pointers, but it is something I am seriously thinking about. The only thing that really disappointed me about Episode #100 was that you only received four emails, and two of them were from me. I guess you can’t force people to write to you. DC Comics Presents Annual #1 has always been one of my all-time favorite comic books. I always loved it when the Earth-1 & Earth-2 Supermen get together. It’s too bad the Earth-1, Earth-2, & Earth-3 Lois Lanes couldn’t have gotten together. I can’t really add anything to what you guys said. I definitely need to re-read it again soon. I like it a lot better than the other three annuals. Annual #1 may not be my favorite DC Comics Presents issue, but it is definitely in my top 5. Well, guess I’d better go for now. 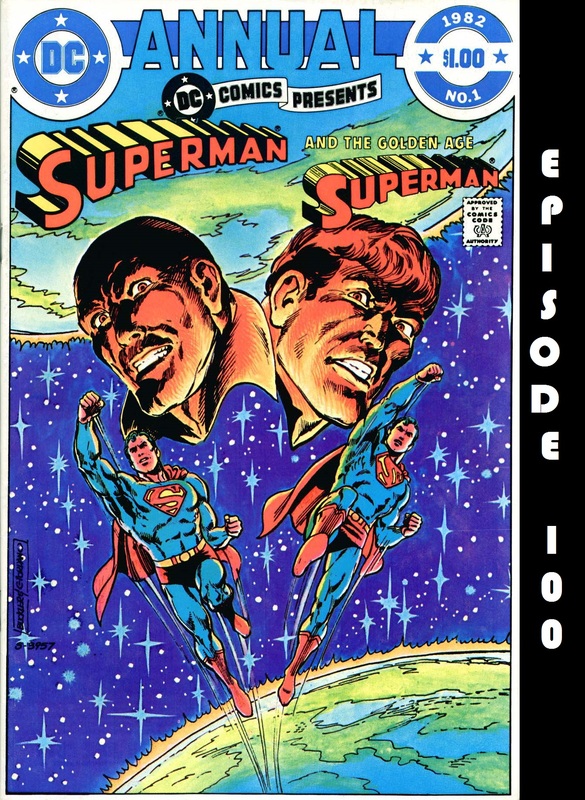 You are probably relieved that #100 is behind you and now you can look towards the end of Superman in the Bronze Age. Keep up the great work and Thanks for keeping me entertained no matter where I listen.